SurfaceShield contains an EPA registered antimicrobial agent (copper 8 quinolinolate) that protects the dried film from microbial attack. SurfaceShield is made from cosmetic grade materials. The SurfaceShield coating protects treated surfaces against abrasion and forms a barrier against microbial laden dust. Suitable for application to porous and nonporous surfaces SurfaceShield encapsulates loose dust and soil. SurfaceShield adheres to smooth surfaces such as metal, plastic and glass. 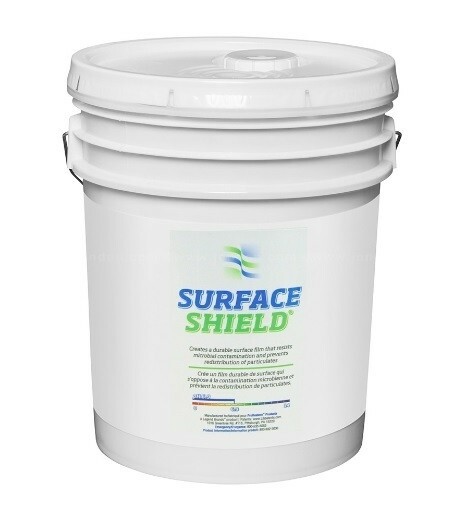 When used as part of a water damage restoration or microbial remediation regimen, the dried SurfaceShield coating is a protective dressing for water or microbial damaged building materials. Elevator shafts, crawl spaces, return air plenums, HVAC system components and ductwork, new construction, microbial remediation & water damage restoration.